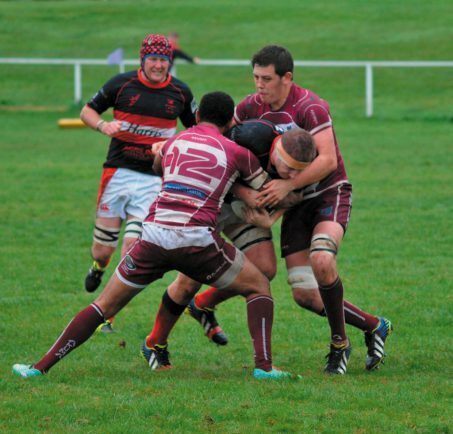 BROMSGROVE suffered only their second league defeat of the season when Newport (Salop) came out firing on all cylinders at The Old Showground on Saturday. A James Shewell try gave Boars an early lead and they went toe-to-toe with the hosts for much of the match as they trailed 26-21 with just over 20 minutes left. But Newport found an extra gear and Dan Protherough’s side could not live with it as they conceded three unanswered tries before Tom Hunt went over for a late consolation score. Since losing to Hinckley, Bromsgrove have got themselves back on track, but after opening the scoring with a Richard Mahoney penalty they fell behind when Josh Evans intercepted a floated pass to score. Despite the set back, Boars were putting Newport under pressure in the early stages and they soon regained the lead when Shewell crashed over following a catch and drive. Mahoney added the extras to move his side 10-5 in front. The lead changed hands twice more as Ash Paterson scored a superb solo try which Liam Holder converted before Mahoney landed a penalty to edge Bromsgrove 13-12 ahead. But it was Newport who went in at half-time in front as Henry Vaka seized upon another loose pass and sprinted 75 metres to the try-line to give Holder an easy conversion. Boars hit back with a try after the break, but Vaka then got in the act again as he went over near the posts, which Holder converted. The game was littered with handling errors on both sides, while Newport were reduced to 14 men before giving away another penalty, which Mahoney dispatched. Trailing by five points, Bromsgrove knew they only needed a try to get back on level terms, but Newport then produced a devastating spell, with three tries coming in ten minutes to open up a 45-21 lead. This secured Newport the win, but Bromsgrove still had the final word as Hunt touched down in the corner.